This year’s Overland Expo was a wintery mix of adversity. The wheat was separated from the chaff as attendees braved rain, sleet and snow, wading through the mud from display to display. Treasures were to be found and those who went looking came away well rewarded for their efforts. My name is Bill and I am a gloveaholic. I also have Raynaud’s disease. My hands don’t like the cold. When temperatures drop below 50 degrees, my fingers turn white and they hurt. Good gloves are an important part of my life. I put them on even before my wife gets goose bumps. 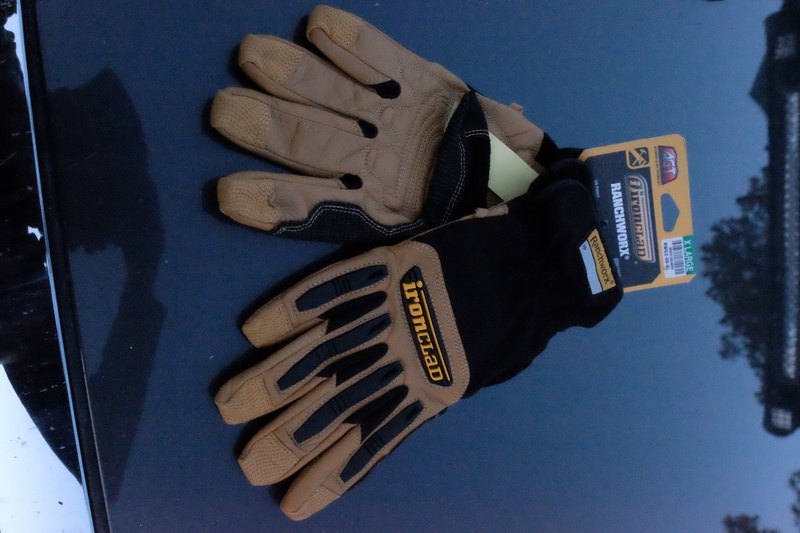 Recently at Overland Expo in Arizona, where outdoor enthusiasts come together to share stories and check out the best in adventure-related gear, I stopped by the Ironclad booth and picked up four pair of gloves. A pair of black Mechanics went in my tool bag. 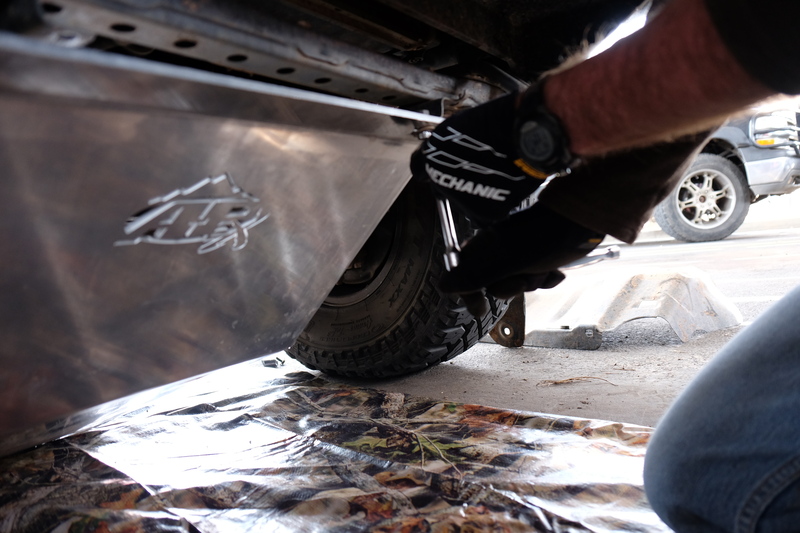 I stowed the Ranchworx in my driver’s door pocket for quick access, and put a pair of Kong Riggers in my winch bag along with the Operators as a back-up. It was a good decision. Our truck is teetering on the edge of a mountain trail on Reservation Ridge. It is late May and the passes in northern Utah are still covered in snow at the upper elevations. Ten feet ahead Susan stands knee deep in a drift, spotting my progress. “You’re slipping!” She says for the third time. This is not going well. There is no place in front to attach a winch line and I am inches from a rollover. To my left is a tree, at an impossible angle from the hawse fairlead. I fear the synthetic Spydura cable will be cut if I try to winch at this angle, but there is no other choice. 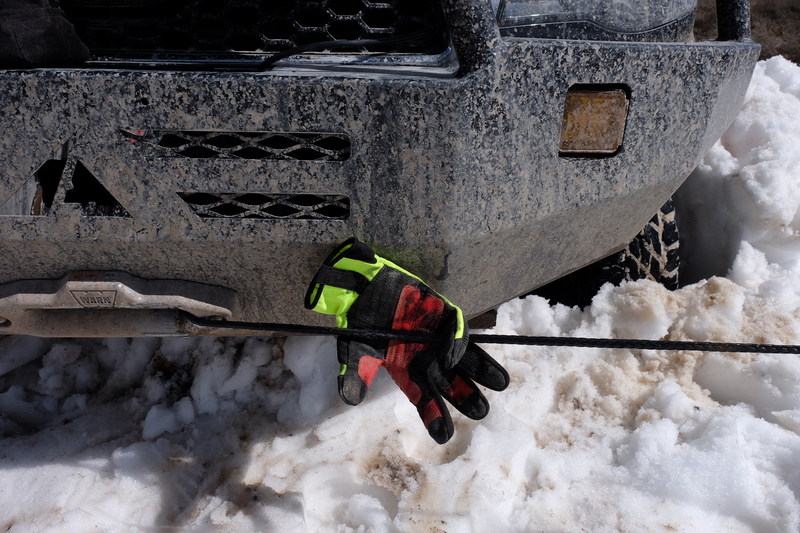 I take off my glove, the Kong Rigger, and place it between the cable and the sharp edge of the shackle lug on my front bumper. Something must be sacrificed and a replacement cable is more than $300. The winch line goes tight just as the rear of the truck slips over the edge. I keep my thumb on the switch, praying that the cable won’t break. The truck ploughs sideways through the snow and finally aligns itself uphill above the drift. We are out. Fearing the worst, I inspect the cable and discover to my surprise that there is no damage. 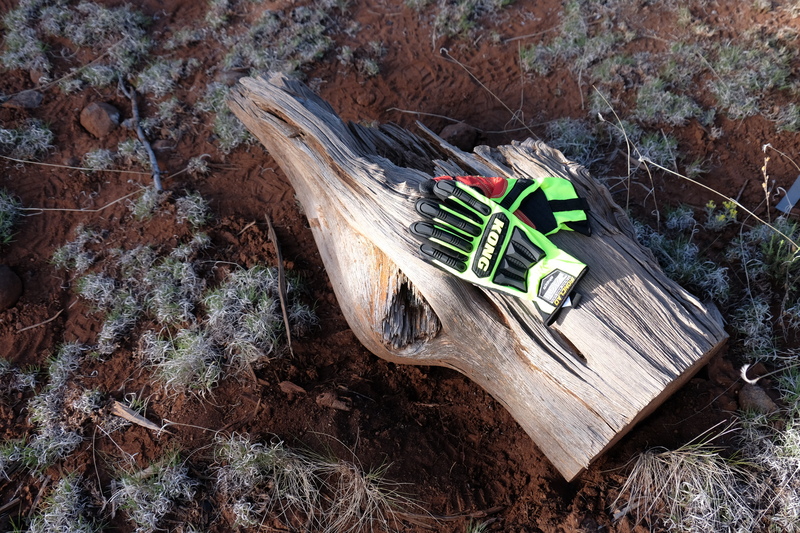 The glove has a dark crease down the palm, but is otherwise unscathed. Loss? Net zero. 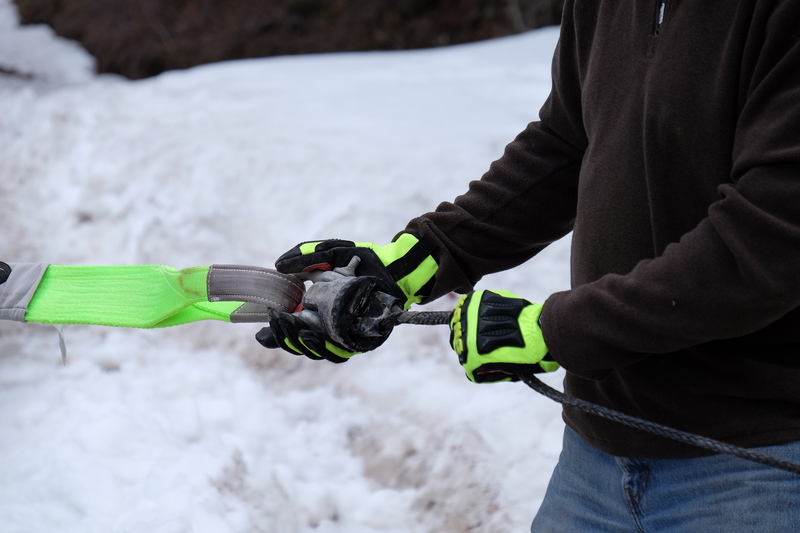 The Kong Rigger is designed for rough work, but who would have thought it could tackle being pinched between a sliding 9,500 lb. winch line and a sharp metal lug without disintegrating? With a second thickness of Duraclad leather in the rope gripping area of the palm and high wear areas of the first two fingers, these gloves are made to stand up to the oil and gas industry standards for which they were designed. Stout thermoplastic rubber (TPR) ribs over the metacarpal area, knuckles and finger bones provide up to 80% impact protection. This is a glove meant for no-nonsense action, yet it is still surprisingly supple and provides good feedback to the user. With my Kongs soaking wet, I donned the Operators, de-rigged the winch set-up and packed it all away. The Operators are much lighter and even more flexible than their big brother. Still equipped with sturdy leather over the thumb, forefinger and first two finger pads, the soft but tough single layer palm feels great while the areas of greatest use are protected. The breathable hi-viz green and red scheme of both pair helps prevent loss when rushing around to get back on the trail. 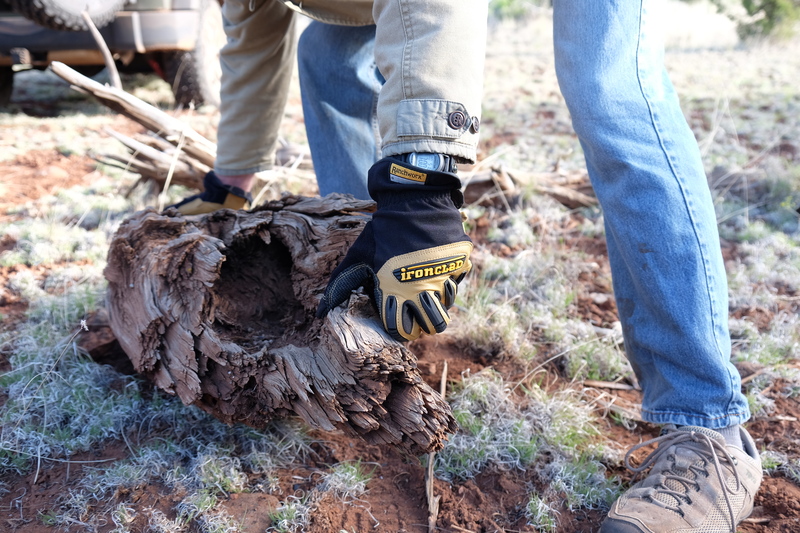 The Ranchworx became my go-to gloves around the campsite and for loading the truck each morning. Their machine washable, tan bullwhip-leather palm and finger sidewalls look and feel great. 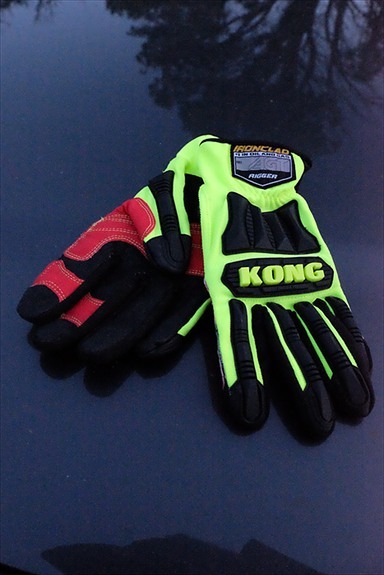 Softer than the Rigger, they are Kevlar and Duraclad-reinforced in the thumb and forefinger gripping areas for extra durability. Patented roll-top fingertips and Exo-guard armor provide great protection where most needed. A handy terrycloth wipe adds a friendly touch to a tough piece of gear. 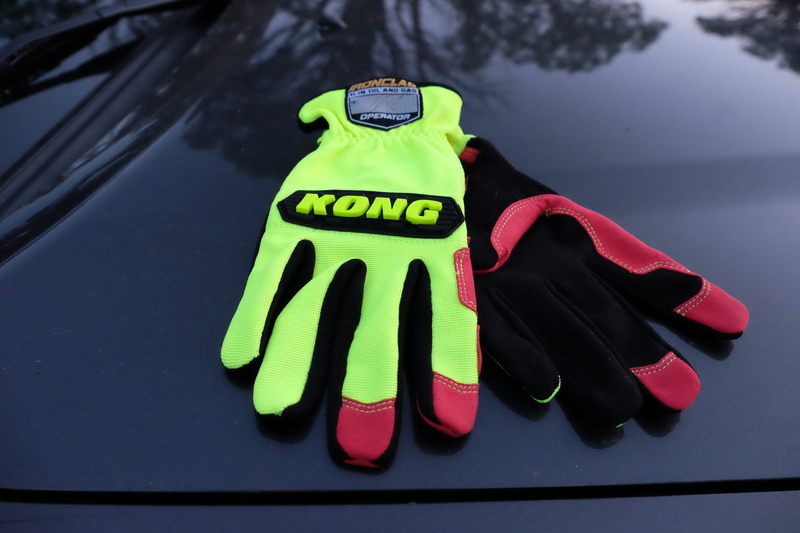 At $10, the Mechanics have to be the world’s best bargain in gloves. I used them to install a skid plate purchased at the Expo. Lightweight and breathable, they offered plenty of confidence to allow full power on the ratchet when busting loose the bolts holding on my original belly armor. Synthetic leather covers the entire palm and finger chafing area with an extra wrap between the thumb and forefinger. 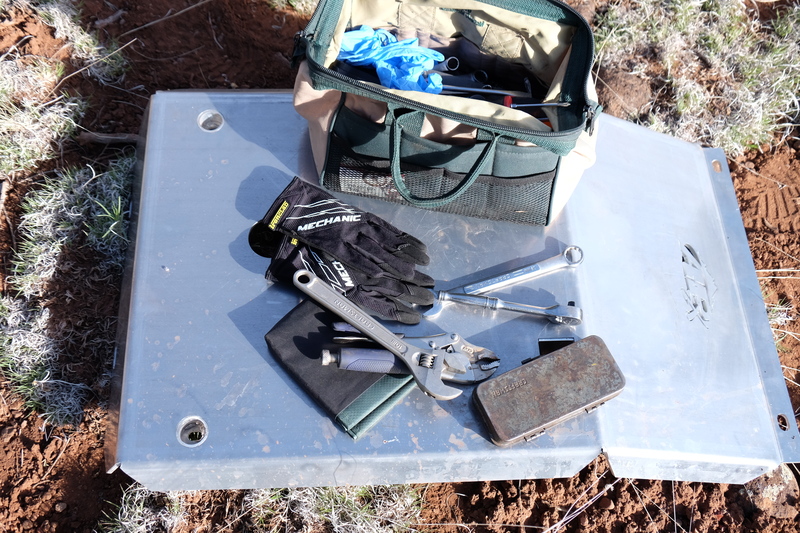 A terrycloth sweat wipe carried over from the Ranchworx caps off the value of this essential piece of kit. All but the Rigger have a thoughtful TPR tab at the cuff to make them easier to pull on. Comfort and fit are critical components to any protective gear. If it bugs me, I am less likely to put it on. I found the Ironclad line much like my old Tony Lama boots. Once I learned my size, I could buy them sight unseen and every time I wore them, my feet felt happy. Ironclad has done a great job with their mitts, protecting ours. I’ll keep these stashed around for a long time. Winter or summer, when they wear out, I’ll be hunting another pair. Great write up on the gloves.. reasonably priced too! I need a couple pair for my truck! Next ArticleNew Video: Adventure Riding Clinic July 13-14, 2015!